At twenty years old, the World Wide Web isn’t exactly new any more, but it’s still at an early stage of what it will develop into. Yet, amazingly, we already have people complaining that ‘it wasn’t like this in my day’. Specifically, there’s John Naughton, who argues in today’s Observer that Graphic designers are ruining the Web. His argument is that due to designers obsessing over the look of websites, the core content is sacrificed at the hands of bloated webpages that are far larger downloads than they should be. He notes that from 2003 to 2011, the size of the average Web page grew from 93.7kB to over 679kB. 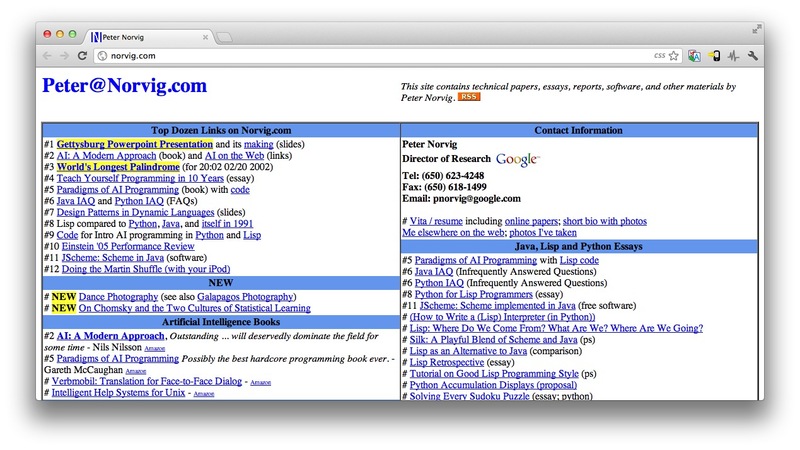 To support his argument, Naughton gives the example of one Googler who maintains an incredibly old-school website. If you’re under the age of about 25, you probably don’t remember when the Web looked this bad, but in about 1994, all sites resembled this. It was fine at the time, but we moved on, and we learned that Tim Berners-Lee’s creation could be about far more than just text and hyperlinks. As the Open University’s Professor of the Public Understanding of Technology, and with two books about the Internet under his belt, John Naughton should know better than to argue that graphic design on websites is just about aesthetics – the Web isn’t the “Library of Alexandria on steroids” he suggests it is, it’s grown into a multimedia canvas for human expression. Through video content, audio clips, tastefully implemented HTML5, heck – even with the much-maligned Flash, we can create Web pages that do far more than offer written content – they can stir our emotions in ways that simply weren’t possible a few years ago. Graphic design is a valid and important part of the overall content. Think of the Google/Arcade Fire Chrome experiment The Wilderness Downtown, for example – I hate to think how much bandwidth that hogs as it loads, but the sensation of a personalised music video is worth it. It’s not just about these extreme examples, either. Even ‘conventional’ sites’ benefit from attention to design. Here at The Next Web, we convey subtle messages about who we are and our attitude to the world through the way we look. That’s part-and-parcel of the content. Design is a language, and Naughton clearly doesn’t understand it. That said, he does make one valid point – bloated websites affect accessibility of websites for people on slow connections. However, that’s just down to poor optimisation of web content. Overly large, slow-to-load websites have nothing at all to do with graphic design. Yes, the Web isn’t what it used to be, and that’s a really good thing. Welcome to the Web Luddites Club, John – I hope there aren’t many more members.